It was a Sunday morning surprise like no other. My friend Henry and I attended Brendon Burchard’s Experts Academy in Santa Clara, CA over the past four days and Brendon, ever the gracious host had been peppering in some speaker surprises during the weekend. But on Sunday morning, the last day of the conference, he completely out-did himself when he welcomed author Marianne Williamson to the stage. Marianne looked lovely in black and was quick to focus this audience of eager experts-in-training on what really matters. Love, service, and spirit. Marianne’s graceful and powerful delivery was inspiring and I would love to share with you three standout lessons from her talk with us. 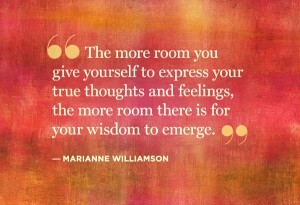 Lesson #1: Each day we must allow our greatness to flow from inside us. 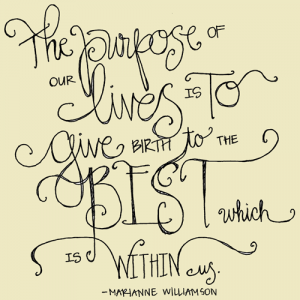 Marianne said, “An embryo doesn’t have to try to become a baby, and an acorn doesn’t have to set a goal to become an oak tree.” Sometimes we get so caught up in the task-driven world we live in that we forget who we are. We are spiritual beings having a human experience. As such, we were born with greatness inside of us. 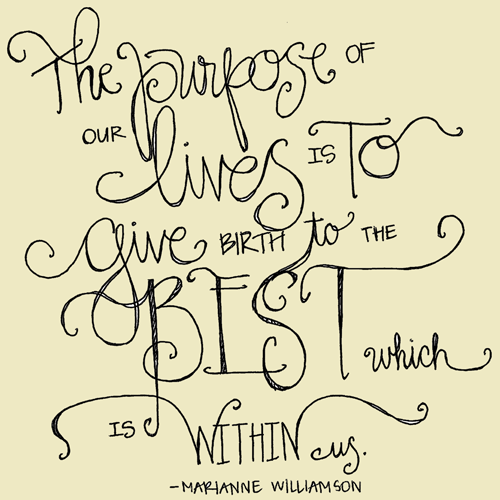 Born to become who we are so that we will serve the world around us and contribute to the communities which we belong. What differentiates us from the embryo and the acorn, though, is that we have the power to choose who we will become. We are not on automatic pilot flying through the skies of life. We must choose every single day who we want to become and how we want to contribute. She suggested we say to ourselves each day, “On this day, may I be the person I am capable of being.” I agree. Lesson #2: We have to lay down our ambition to accomplish our assignment. Marianne continued, “Every one of us has a set of talents and abilities that need to be surrendered to God so that they can be used in service to the world around us.” When we’re setting our sights on what it is that we think we want to accomplish, are we going in God’s direction or our own? This is a lesson that has a large amount of personal significance for me because I laid down my ambition to become a world-class professional drummer in order to fulfill the calling that I felt the Spirit had on my life to instruct and inspire others to improve their lives and achieve their goals. She suggested the best questions we can ask ourselves to ensure we’re learning this lesson are, “How might I serve?” and “How might I be of use?” Powerful questions demand powerful answers. Lesson #3: When we create a space that allows people to feel loved then we will be successful. Marianne continued, “We are the faucet, not the water. When we allow ourselves to get out of our own way, then we allow others to feel the presence of the love coming out of us.” Success then is not the result of what is flowing into us (wealth) but what is flowing out of us (contribution) in service to others. When we create that kind of space, then we allow others to stand in the light of love and feel that we are serving them with the best of our ability. She then warned us, “Don’t reduce human interaction into a transaction. When we do that, chaos is the result.” When we allow the love that’s within us to flow out of us by getting out of our own way, then we are on our way to achieving our greatness. 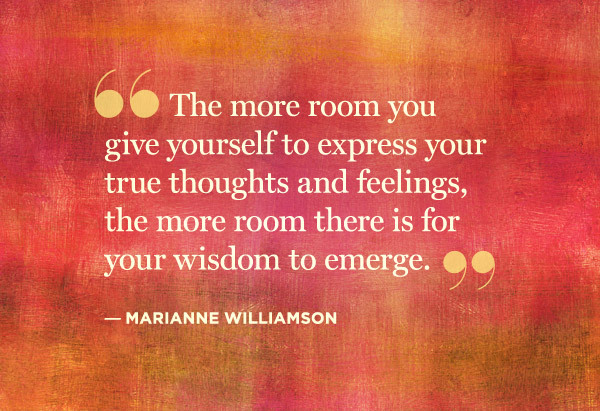 I’ll leave you with one final thought from this awesome talk given by Marianne Williamson. She said, “Darkness is not a thing, it is the absence of a thing.” And what is that thing? Light. Fear is not a thing, it is the absence of a thing called love. It may be fear that is keeping us from growing into our greatness, but fear goes away in the presence of love. When we proactively fill our hearts with light and love, then we allow no room for darkness and fear to keep us from becoming who we really are. Question: What are some great life lessons you’ve heard along the way that serve as a reminder of leading a life worthy of your calling? Please share your wisdom with us! You can leave a comment by clicking here. Great article, thank you for sharing your heart as you always do. Had to read this again to remind myself to get behind myself. Love this!